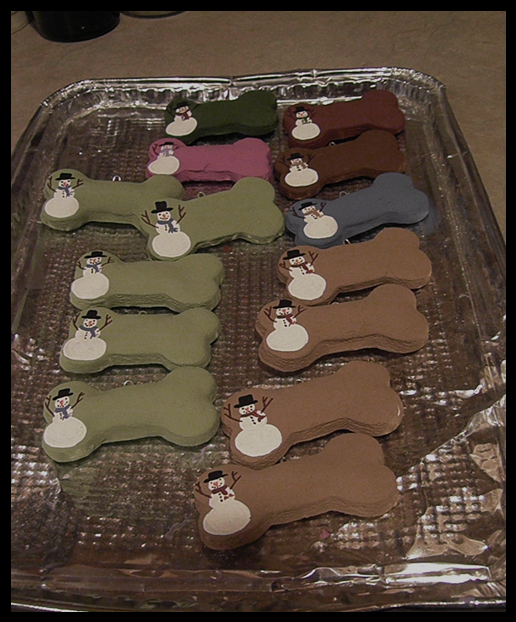 Last year, we made salt dough ornament in the shape of doggy bones. 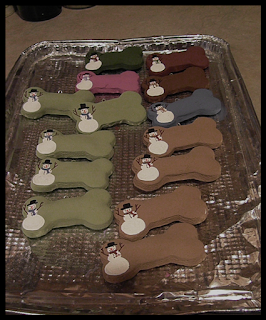 Like with this year, I handpainted snowmen on each of the ornaments and offered an array of colors to choose from. This year, the snowmen feature a pawprint on their hats. Unfortunately, with the salt dough ornaments, I was not able to finish the ornaments off with a satin varnish protective coating. The salt in the ornaments had a chemical reaction with the satin varnish. Another problem I encountered was the fragility of the dough. A single batch produced about 24 ornaments. However, due to bubbles in the dough and cracking, I was only able to use 12 out of the 24. Thankfully, I made a few sample pieces prior to completing orders. This year, we decided to use wood for the ornaments. Lisa cut and sanded down to size. I painted, gently distressed, handpainted the snowmen, applied the satin varnish, added a looped hook to the top, and finished off with a twine hanger. One of the things I adore about our 2017 Bodacious Country Holiday Ornaments is that they're not entirely "for pups only...."
Last year, I received a bunch of emails and messages asking if we had plans on making cat themed ornaments. At the time, we did not. This year, the ornaments cater to all pet parents. With a simple pawprint on the hat, our 2017 Bodacious Country Holiday Ornaments are appropriate for most pet parents. If interested leave a reply on our Bodacious Biscuit Love Facebook Page or send us a message. Please specify what color and the name or message you'd like on your ornament/s. You have until Monday, November 13th to order. All orders will be ready for pickup or shipping the last week of November.